The Women’s Health Perfect Body Diet was created by the editors of Women’s Health Magazine as a solution for those who are stuck on the dieting roller coaster and tired of following weight loss plans that are impossible to maintain. This program is designed to help you to overcome hunger, build lean muscle and burn fat while maintaining a high level of energy and vitality. It takes into account that every woman is different – with varying metabolism and hormone levels – so a unique weight loss plan is required to teach women how to get the perfect body. The Women’s Health Perfect Body Diet is an eight-week structured program that also provides readers with education about basic nutrition and fitness. The program is comprised of three components: Perfect Planning, Perfect Eating and Perfect Movements. After undertaking an initial assessment you will be recommended to follow the right eating plan for your particular metabolism. The idea is that by working with your body chemistry you will ensure that you consume the ideal amounts of carbohydrates and fiber: two nutrients that have been shown to be vitally important in your chances of successfully losing weight. The Perfect Body eating plans include five to six small meals daily containing a balance of protein, fat and carbohydrates. Once a week you are allowed to have a cheat day where you can enjoy your favorite foods. How to get the perfect body centers on the use of a soluble fiber called glucomannan, which helps burn fat and keeps you feeling full. This substance is to be consumed with every meal and all of the recipes in the perfect body diet feature glucomannan as an ingredient. Glucomannan Powder, Chicken breast, turkey, tuna, shrimp. eggs, low-fat plain yogurt, low-fat cottage cheese, goat cheese, whey protein powder, almond butter, sunflower seeds, walnuts, brown rice, whole wheat bread, Fiber One cereal, spinach, celery, baby carrots, onion, apples, blueberries, raspberries, light mayonnaise, mustard. Dieters are advised to exercise for at least 30 minutes a day, six days a week, with a combination of cardio and strength training. 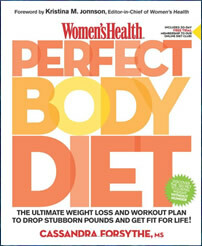 The book includes exercise routines for each of the eight weeks that teach women how to get the perfect body. Women’s Health Perfect Body Diet: The Ultimate Weight Loss and Workout Plan to Drop Stubborn Pounds and Get Fit for Life! retails at $15.95. Encourages the intake of a wide range of unprocessed, natural foods. Includes eight weeks of meal plans and recipes. The Perfect Body Diet does not require calorie counting. Glucomannan can help to reduce appetite. Includes a detailed fitness plan. Website provides additional support including a meal planner, grocery list, nutrient summary and tracking tools. Will involve more time spent on meal planning and preparation. The Perfect Body Diet requires the use of nutritional supplements. Glucomannan powder may not be easily accessible in all locations. Does not provide vegetarian meal plans. How to get the perfect body is an eight-week program including a structured eating plan and fitness regime that is customized to suit different metabolisms. An important part of the Perfect Body Diet is the use of a soluble fiber called glucomannan, which has a unique ability to reduce hunger that ultimately can assist dieters to reduce their intake of calories with minimal discomfort.